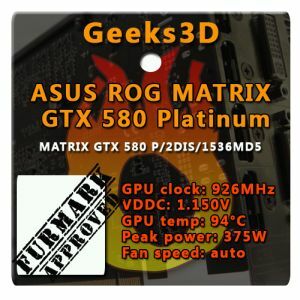 No doubt, ASUS’s ROG MATRIX GTX 580 Platinum is a great graphics card for overclockers. It comes with many features such as ProbeIt (voltage check points), ModZone (for LN2 overclockers), TweakIt (100% fan speed, GPU voltage), a customized PCB and VGA cooler, power connectors LEDs, and the Safe Mode button that can restore default settings in case of bad overclocking. The GPU load indicator is certainly the geekiest gadget of the card even if I didn’t manage to see the color of the idle state (maybe a BIOS update could fix the problem). The strong 19-phase VRM allows to overclock the card without fear, because you know that the power circuitry will handle the load. I was really impressed by the FurMark burn-in test close to the 375W. I managed to overclock my MATRIX sample at 926MHz (+13% compared to the factory setting and +20% compared to NVIDIA reference clock) and I used this overclocking setting for the complete review. The triple slot VGA cooler, DirectCU II Matrix (bulky as hell), gives a dynamic and aggressive look at the card. But under FurMark, this massive cooler is a bit noisy (fan speed: auto) and doesn’t prevent the GPU temperature to exceed 90°C. But FurMark is an extreme test (it’s a stress test after all!) and under all other applications (games or synthetic benchmarks) the GPU temperature was under or around 70°C. In the software side, GPU Tweak is a nice and very complete overclocking utility. The few little problems (interface, update) should vanish with the next versions. 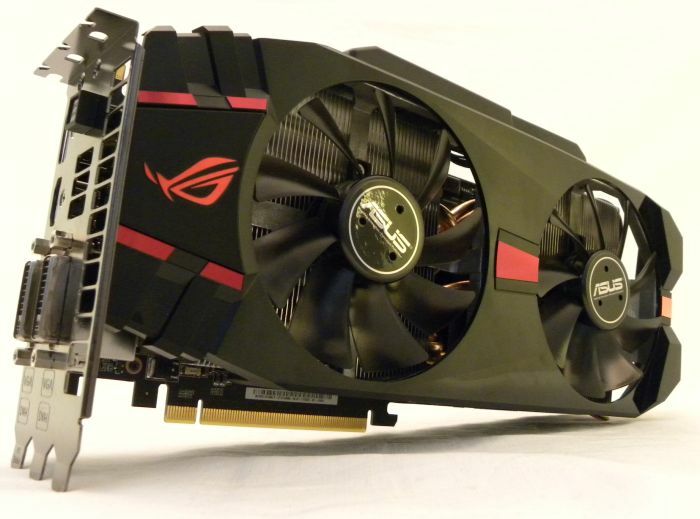 The MATRIX GTX 580 should be priced at US $530. I can’t wait to see some LN2 overclockers pushing this card to the max like HERE. 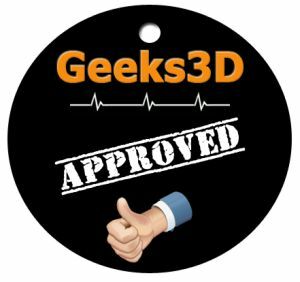 – High quality components and FurMark approved VRM!